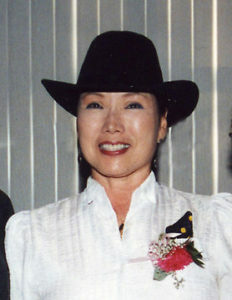 Sue Kim Bonifazio as one third of the Kim Sisters came to Las Vegas in 1959 and began performing at the Thunderbird Hotel. Sue Kim performed regularly until 1991, when she retired and began working in real estate. The Kim Sisters became a popular act in the early years of the Las Vegas Strip. The Kim Sisters, Sue Kim, Ai-ja, and Mia, gained fame while singing for American GIs in war-torn Korea. They did not speak English, but memorized songs phonetically and played traditional instruments. Their talented renditions of familiar songs, including Elvis’ hit songs, impressed Americans. With an orchestra leader as their father and their well-known singer mother, the girls had plenty of training in music. Unfortunately, North Korean forces assassinated their father, Hae Song Kim. After his death, their mother taught the children how to perform, including dance and instrument lessons, as a means of provided the support for the family. An American agent saw the Kim Sisters perform in Korea and booked them for a four-week engagement at the Thunderbird Hotel as part of the China Doll Revue in the main showroom in Las Vegas. This job started their successful international career. The sisters’ charisma and talent made them quick successes in the United States and they achieved nationwide fame. In 1959, they appeared on the Ed Sullivan Show. They proved popular with the show’s audience and were guests on the show a total of 22 times, the most appearances of any person or group. Their popularity was at its height at the end of the 1960s, when they performed throughout the United States and Europe. Their success enabled the sisters to help more than forty family members immigrate to the United States. The sisters all married in the late 1960s. Following the death of her sister, Sue Kim began performing with her brothers. She retired in 1991, and began working in real estate. She also works to improve the Korean community in Las Vegas.